You know how you’ve lived in your apartment a whole year and finally think you have the bedroom decor figured out and then you see the most amazing pin on pinterest and it makes you want to slit your wrists and bleed all over your pillows that you now hate? Yea, welcome to my life. Perhaps the slitting of the wrists was a bit dramatic but seriously, I’m annoyed at myself. You’ve seen a few photos of my bed on the instagram, but for those of you who haven’t below is a picture. Granted this isn’t perfect, or done. Please note the “not done” portion. So my thinking was some fun DIY art above the bed, since my ceilings are ridiculously high, I thought I’d really take advantage of all that space. Until I saw this. And obviously the train has gone off the tracks. I want gold frames with bright prints and all white everything. Well, that’s just terrific because I spent a small fortune on the west elm pillows. I love what you have!! You could still incorporate the gold frames?? 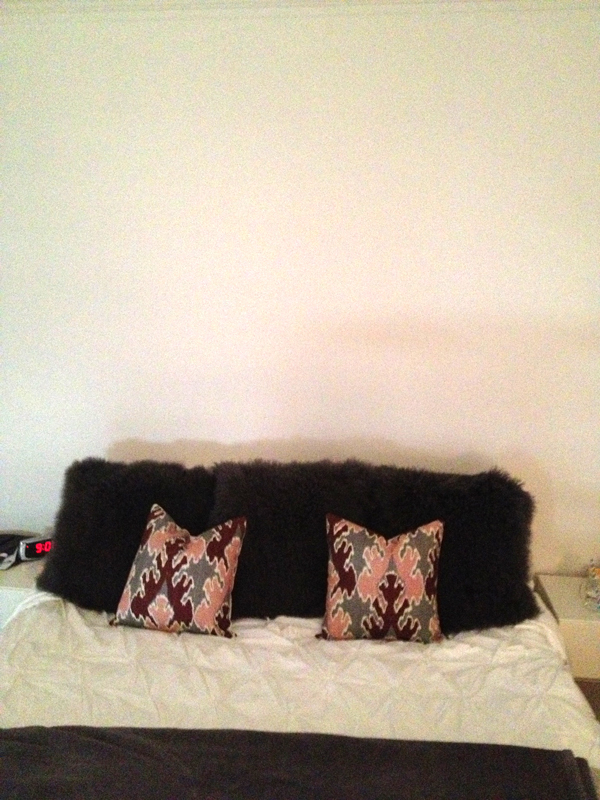 The pillows from West Elm are so to die for – don’t regret it! Butttt I do know the feeling. A little too well probably. Damn you, Pinterest! i think art really has a big impact on a room, maybe a large piece over your bed- viola! Pewter frames? Just trying to make ish work here. But I’m a huge fan of the gallery wall behind the bed. I think you could make it work gurl. I love your pillows – dont be hating on them! I would get an all white headboard and then do the gallery frames above it with colors that match your burgundy & blush pillows. I also would get a burgundy or blush throw for the end of the bed if you want to add more colors. I think gold frames would look amazing & I bet you can find them affordable at ikea or target. Art prints can be found on etsy & almost always prices can be negotiated. The headboard is the bigger impact! I love what you’ve already done but have to agree… that bedroom is pretty perfect. I feel like you could accomplish it with silver tone + black frames and keep the rest of your stuff the same! you can still work something like that – you’ve got lots of neutral still working! I love the idea of a gallery display with lots of photos over the bed! Perfect inspiration. Oh girl, the over the bed decoration ideas always get me. I love the idea of frames over the bed as shown here. This was only after I had the bf put up a shelf. Story of my life. This happens every week to me but with my whole house. Pinterest is amazing but can be so counterproductive at times! ooo that would look nice! That bedroom is gorgeous! I know what you’re saying though. Our bedroom is only half-done partly because I’m afraid I’ll want to change it as soon as it’s finished. ahh i hate when that happens! a quick search shows that those pillows are selling for close to full price on ebay, so you could always try that or craiglist. but i agree with everyone else- adding the gallery wall will have a huge impact and will probably give you the look you are going for… i’d do a mix of metal frames to play off what you have but still get the pop of gold!